Ever since electric toothbrushes became the norm beside upscale sinks in the US, I thought there had to be a manual version that worked as well. I’ve been known to spend entire days touring pharmacies, studying products, ingredients, and packaging. During many of my lengthy visits to CVS and Duane Reade, I began to notice that the rows of toothbrushes in these aisles not only looked more like sneakers than toothbrushes, but very few, if any, were accepted by the ADA. So began my quest for manual toothbrushes accepted by the ADA. I gleefully redirected my search to aisles of Manhattan pharmacies like New London Pharmacy in Chelsea, C.O. Bigelow on Sixth Ave., and Zitomer on the Upper East Side, and my search was fruitful. All three of these locations sell an ADA accepted toothbrush enveloped by a perfectly emblematic toothbrush shape: the Lactona M-Series. 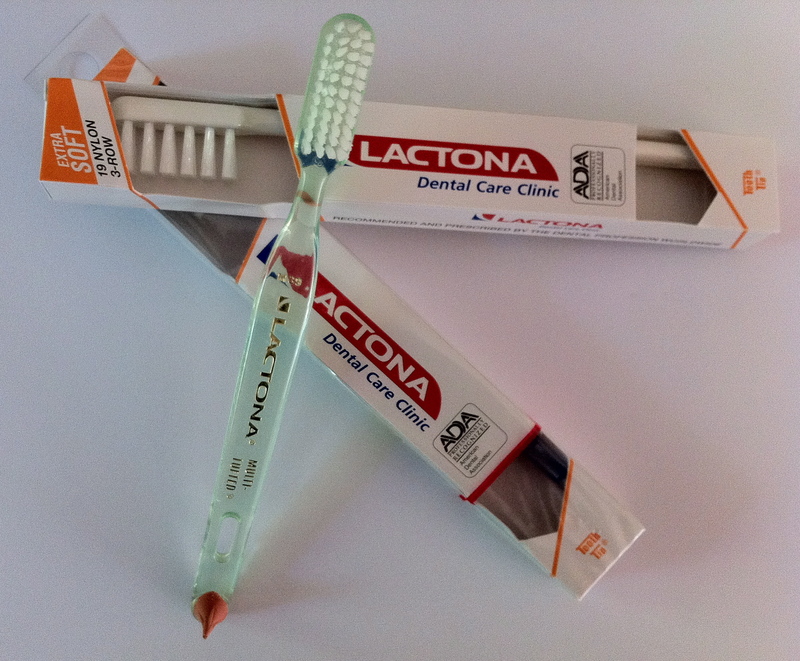 With clear or solid plastic handles measuring about six inches long and 3/8” wide, Lactona M-Series brushes come in a variety of classic colors: red, blue, yellow, white, light green, clear. There are 3-row and 4-row options, featuring soft multi-tufted nylon or natural bristles, ranging from extra soft, for sensitive gums and after periodontal surgery, to hard, for dentures and appliances. They’re equipped with strong rubber tips at the ends–gum stimulators that protect teeth from gingivitis. The Lactona company is based in the Netherlands, but there’s some American ingenuity behind this brand. According to the Lactona website, this brand name was first used as the name of a toothpaste developed by a dentist in the USA in 1931. 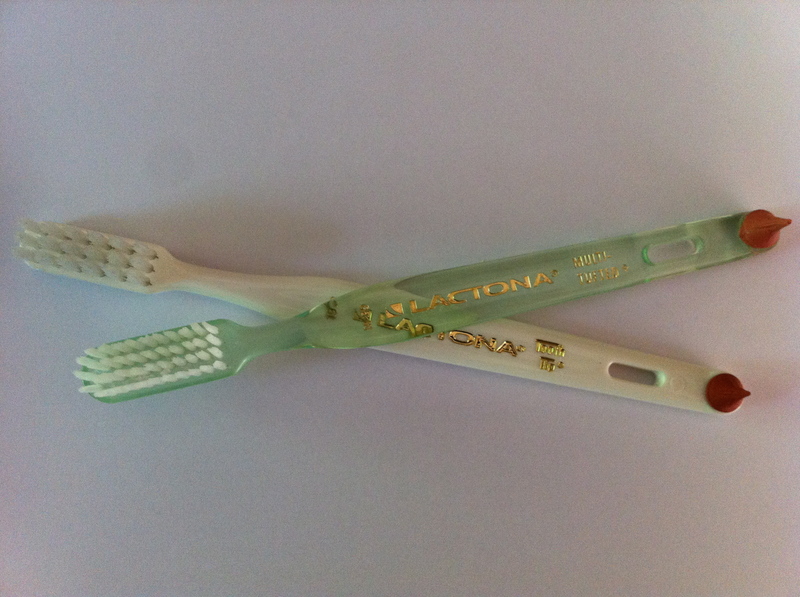 Twenty-one years later, it became the name for a multi-tufted toothbrush, also made in the USA. Production moved to the Netherlands in 1982 and by 1996, Lactona was purchased by a Dutch company. The Lactona News page documents the sale of one of the first toothbrushes that was present for the first moon landing in 1969. This claim is particularly notable because Oral B also claims that an Oral B toothbrush was on board Apollo 11. I have to wonder if Aldrin brought two different brushes or if Neil Armstrong or Michael Collins brought the Oral B. Nevertheless, the Lactona brush, the M39, used by astronaut Buzz Aldrin, was sold to Steven Belasco for $16,000 in 2004. Lactona still sells M39 brushes today. How about a Lactona M39 in MoMA’s design collection? This entry was posted on May 31, 2011 at 5:57 pm and is filed under Uncategorized. You can follow any responses to this entry through the RSS 2.0 feed. You can leave a response, or trackback from your own site.